As part of our commitment to energizing the professional dance community in the Lehigh Valley, LVDE hosts open call auditions for dancers to perform commissioned choreographer's work. Check back to learn about future opportunites with guest artists. Sarah Parker, artistic director of Evolve Productions, set a version of her sultry “Masquerade” on 5 Lehigh Valley based dancers for performance at the LVDE Cabaret Nights at Touchstone Theater in March 24. Lehigh Valley Dance Exchange has commissioned Keith Thompson and his company ‘danceTactics performance group’ to set a repertory work on Lehigh Valley based dancers. Keith’s impressive career includes performing internationally with Tricia Brown from 1992-2001. In 2006, he formed his own company and his work has been presented at festivals throughout the US and abroad. A new work created under the direction of Sarah Carlson, set to Robert Kyr's "The Cloud of Unknowing". The score explores the relationship between human & divine love and has been described as, "hauntingly beautiful". The creative process would unpack the idea of "unknowing" both in terms of spirituality but also in terms of our human condition. Lehigh Valley Dance Exchange has commissioned NYC based artist Antonio Brown to set a repertory work on Lehigh Valley based dancers. We are thrilled to facilitate this opportunity for our community to work with another of the dance industries bold, cutting edge, and inspiring dancer/choreographer's. A dance collaboration between: Tracks // Where will dance take you? ; Lehigh Valley Dance Exchange, and Cedar Crest College. Thanks to the Pina Bausch Foundation for allowing the rights to this work for this project. 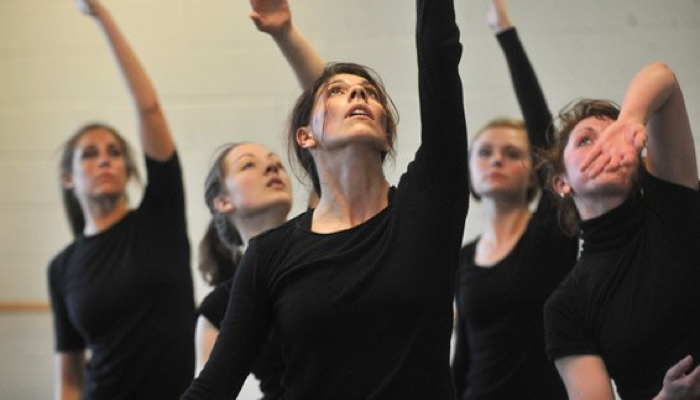 In January 2011, the Lehigh Valley Dance Exchange invited San Francisco choreographer Alyce Finwall, founder and director of Alyce Finwall Dance Theater, to set her work, Enter Demeter, on a select group of Lehigh Valley dancers. Finwall restaged the work during a four-day residency at Cedar Crest College January 14-17. Sponsored by a Lehigh Valley Arts Council Project Stream Grant and the Cedar Crest College Cultural Programs Committee along with support from the Cedar Crest College dance department, Enter Demeter will be performed during the college’s Women as Guardians of Culture event March 24/25, 2011. Enter Demeter explores humanity within the struggle between life and death through the physical manifestation of nine women in a restricted arena. The entirety of the stage becomes the anointed ground in which these women are enclosed and in which they struggle for autonomy, civility and significance within an often fragile and volatile environment where nothing is to be taken for granted. Enter Demeter opposes woman against woman, while also showing the cooperative traits that are imperative to women's existence. With an original composition by Jason Hoopes for strings, voice and breast pump, the dance showcases the beauty, clarity, value and strength of women through the interrogation of all human values. The piece takes inspiration from "The Voyage" by Eduardo Galeano and Faith Wilding's poem "Waiting", which was part of the performance program of Womanhouse, the seminal feminist art installation that took place in Hollywood in 1972. Enter Demeter has been performed to rave reviews at several venues in San Francisco and made its New York debut during the summer of 2010 at Dixon Place. The Lehigh Valley cast performed Enter Demeter at Cedar Crest College on Friday, March 25th as part of the the college’s programming for Women’s History Month. "The Waiting Game", an exploration of women's issues through contemporary dance, was performed in its world premiere, Sept. 30 and Oct. 1, at 8pm at the Bethlehem Ice House. Choreographers Sarah Carlson and Alyce Finwall created all-female dance works sharing a common source of inspiration: Faith Wilding's iconic feminist poem "Waiting." As it turns out, exactly what we envision for the future has a lot to do with our gender. “The Waiting Game” was a co-production of DANCELINK and the Lehigh Valley Dance Exchange, two Lehigh Valley-based dance organizations whose shared mission is to promote dance and dance opportunities in the Lehigh Valley community. Select dancers performed a choreography commission with Pittsburgh based choreographer, Shana Simmons. Shana Simmon's work, 'Synapse' was performed on March 24th at LVDE Presents, Cabaret Nights held at the Touchstone Theater in Bethlehem, Pa.